JoahBox is a monthly subscription box of 5 to 7 full-size Korean beauty products from brands likeA’Pieu, Missha, Nature Republic, Etude House, Saem, Innis Free, MemeBox, handpicked and shipped directly from Seoul, South Korea to your doorstep. Each box will have up to $100.00 retail worth of product. The Cost: $35.95/month with free shipping. Save with longer commitments. COUPON: Use code MYJOAHBOX to save 10% off! The Products: 5-7 full-size Korean beauty products. Good to Know: Monthly prices recently went up from $33.00 to $35.95. You will choose your birth month (perhaps for a birthday surprise? ), skin tone (ranging from “very fair” to “dark brown”), your skin type, and if you’d prefer to receive more skincare, makeup, or both. Once again, the items came inside a plastic drawstring pouch, so I think it’s safe to say this is a permanent change for JoahBox. There’s an info booklet with each delivery that goes over the included items and how to use them. It’s best to hold onto this since a lot of the packaging is in Korean only. You’ll also get a collectible playing card. This chubby gold stick is really creamy and has a wonderful gold/bronze color to it! You can wear it as a liner or smudge it to wear more like a shadow. Once it sets it stays put and doesn’t end up above my lid like some liners tend to do. The staying power is really quite impressive and it’s hard to believe it glided on so creamy at first! This is an easy way to add a pop of glitz to your makeup for a night out! I’m tempted to try the matte versions of this! Well, now I feel silly because I just bought a really similar product while at the Tony Moly store in Seattle last week. This color is a bit more orange and cheery than the one I bought, so it’s all good. I love how the packaging looks like a cream stick (which was a little confusing when I tried to first open it) but it’s actually a liquid tint. The formula is really thin but super pigmented and smells like fruit! It’s somewhere between a gloss and a stain, so beware that once you put this on, you can remove the bulk of the product but the color will remain on your lips! A great product if you don’t like how lipstick feels on. Here are swatches for the eye stick and lip tint. Okay- wow. I haven’t done much peeling and was skeptical about this one. I was afraid it’d be harsh but it wasn’t AT ALL. After cleansing and drying my face, I took a couple of small drops of this onto my fingertips and massaged it into my face in a circular motion. It took a minute for the peeling to start and it wasn’t really outrageous but after washing it off, MY WORD it felt like I had brand new skin. Everything I did after this was just icing on the cake. Highly recommend this unique product when you need to get rid of dull skin! Ridiculously gentle too! I am digging this calming cream which contains azulene that comes from steam distilling chamomile. How lovely! It’s anti-inflammatory and will help chill out any redness or irritation in your face. It’s powdery soft when applied and although the floral scent is a little strong, I don’t mind it too much. Will be adding this to my routine when I need to help balance out my skin tone as I tend to get a little red in my chin. I. LOVE. THIS. MASK!!! Click the link above to see how freaking cute it is! It’s a jelly mask with holographic stars and glitter that goes over your eyes and makes you look like a superhero while it soothes your delicate skin. It feels cool while on and smells really nice which is rare for a sheet mask. It’s supposed to brighten and calm eye bags which I always have a hard time noticing after one use but this is just so much fun compared to a lot of masks I review, so it gets a gold star! My face where the mask sat was literally glowing with shine once I took it off and there wasn’t any messy serum to deal with either. Love it! After the peeling and eye mask, I was ready for a little face oil to hydrate! They’ve sent this sample size to see if it’s something the subscribers would like to see a full-size version of in a future box. It’s all-natural, vegan, and cruelty-free which is right up my alley. They’ve included Commleaf in a past box, so I’m a little familiar with the brand. This oil can also be used for hair, but I decided to try it on my face. This has a really pleasant scent that’s a little stronger than most face oils, but I really like it, so I’m not bothered. It’s super lightweight and didn’t feel over greasy at all. It quickly absorbs into the skin and leaves it feeling soft. My vote is yes for a full-size of this one! Verdict: JoahBox hooked me up with all sorts of interesting and new products this month! I found the perfect mix of makeup and skincare and was really excited about the mask, peel, and lip tint the most. I found everything to be super useable and fun to try! Can you still get this box if you sign up today? Not this one, but if you order by April 5th you will get the April box! We ship boxes on the 10th of each month. Once your box leaves our facilities, it can take about one to three weeks to be delivered. We accept orders until the 5th of each month. 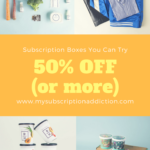 Coupon – Use code MYJOAHBOX to save 10% off! Value Breakdown: At $35.95 for this box, each item in the box has an average cost of $5.99. Check out all of our JoahBox reviews and the Beauty Subscription Box Directory for more K-Beauty subscriptions! What did you think of this month’s JoahBox? I feel so silly asking where is the Tony Moly store? Why, because I live in Seattle. I hoped you enjoyed your visit! It’s in Bellevue Square, 2nd floor 🙂 I was just there two weekends ago! Bellevue Square is incredible! Y’all are lucky. 🙂 I had an excellent Seattle trip- love it there! Luna- I must have just missed you! Darn, that’s out of my five mile driving radius🤣. I hope you had some delicious coffee and were able to see Mt. Rainier. Thanks for your fab reviews! Ya, Bellevue Square is a lot of fun, but next time you’re in the area you have to check out University Village. I think you’d love it. It’s my most favorite mall in Seattle and the surrounding area. It’s a beautiful outdoor shopping center, and on the beauty front they’ve got so many options from Follain (woo-hoo! ), Blue Mercury, Sephora, Kiehl’s, Aveda, L’Occitane, Anthropologie (I know they’re not a beauty store, but since I only buy beauty from them, they’re a beauty store to me 😉 ), and I’m sure a couple of others I’m forgetting. They are missing a permanent K-beauty store though. They did have a really fun pop-up k-beauty store that closed maybe a couple of months ago. I hope they did well (I know I did my part 😉 ), as I’d love to see a k-beauty store there! Luna, you are one lucky gal to live in a Seattle! I had my first visit there this past September. I have an aunt who moved there w her family years ago and finally made it out there. I’m thinking I want to move there now. 😉 I think I visited this same mall, University Village while I was there. I remember a K-Beauty store w a whole wall of sheet masks and a Jaguar or Maserati showroom in the mall?? Not sure which one. But that mall, if it’s the same one I’m thinking of, is super nice. Planning a second visit in August. I’ll have to get your email to get some more suggestion’s on where to visit shopping and restaurant wise! Oh, Luna, don’t you worry! I went to University Village too! Haha. Clearly, I am a shopping hound! I had a delicious Thin Mint cupcake there. My friends told me about that K-Beauty pop-up and it must’ve done well because we saw signs for a permanent one coming soon! I also visited that Follain and it was amazing! My friends know my interests and planned out so many places check out! Haha. I 100% feel you on Anthropologie. They don’t stock very much beauty in the ones here but when I was in SF in January I was delighted at how much they had! It was so lovely! The Nordstrom in Bellevue Square also has clean beauty pop-up right now that we stumbled upon! I went a little wild at the Kiehl’s there too. LOL to “constantly side-eyeing you trailing you in the store the whole time thinking “Is that really Marne???””. How lovely that’d be! That eye mask does look amazingly fun. If I wasn’t over loaded with them I would order some of these. Maybe at a later date. Thanks.